Open the App store right now. Take a look at the top 25 free apps right now. Look carefully. Yes, most of them are games. 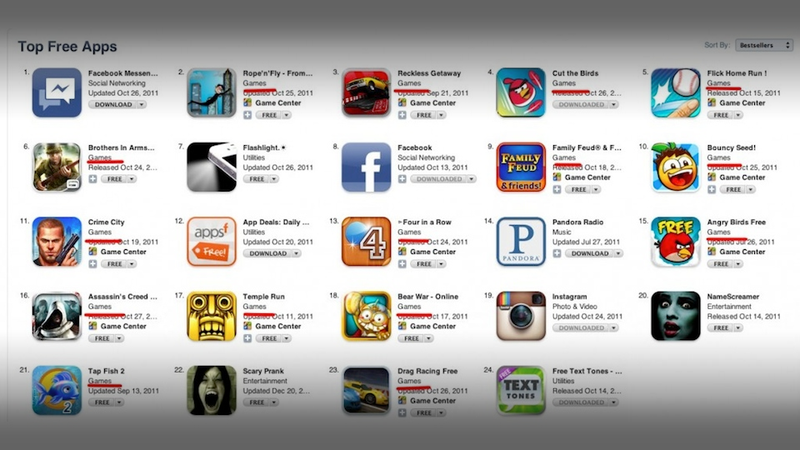 In the screenshot above taken a couple of days ago 15 of the top 25 apps are games. 1 category for more than half of the hits. Take a lot at the Top 50, most of them are games also. Games are the hit category. Games are also the most monetized vertical and therefore the section where most apps are investing in paid marketing to get up the charts [we're talking big money]. The only problem with that is that, Games are distorting the discovery of the other 20 categories. It is really really hard to get noticed in the charts if you're not a game. And quite frankly this is not fair. Some manage to get up there: Facebook (mmm..wonder why…) or regularly featured apps (Pandora, Instagram), and sometimes other types of apps. Games are a store in the store. It is the only category, that has sub-categories because the catalog is too deep. Apple would make a great service to the developers' community but also to gamers, if, like music, movies, books, they created a separate store with its own sub categories, allowing other verticals to surface for and get really discovered. Games have their own nervous center (the Game center), their key monetization path (in app, which is mostly used by games), its own user base and ecosystem (from developers, to app networks like openfeint or scoreloop). Games are a separate vertical and should be treated in a separate store. More games would be found, More non games would be visible. Here is our Suggestion: Transform the game center in the Game Store. or add a section to it. You can still give access to Games in the App Store for cross merchandising, but clearly separate them. Google has done it already in the Android market. In Retail and the Software industry, games are not sold next to productivity software, even in Apple Stores. So why mix them? There may be some good reasons like: by looking for games you can discover other sections you would not know. But that is not enough. Games have too much inertia. The app economy is too big now to mix everything altogether. More clarity is good for all. Republished with permission from Appsfire.